Taoiseach Garret Fitzgerald said the Government were not trying to be “spoil-sports”. 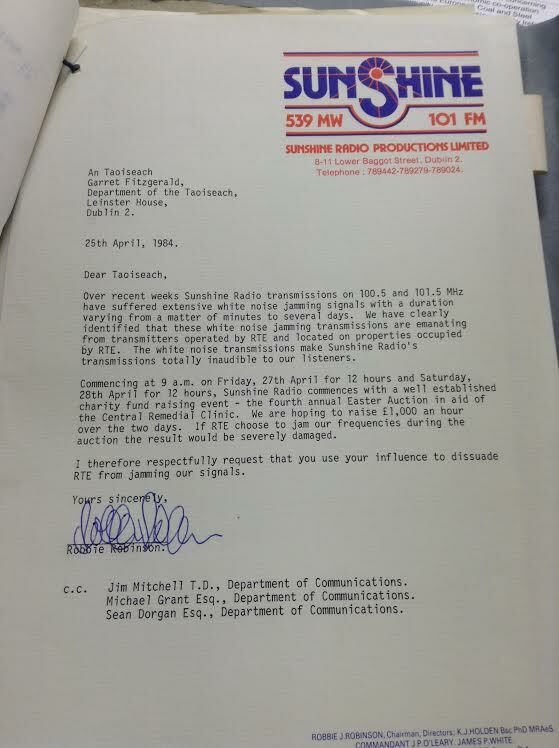 PIRATE RADIO STATIONS caused quite the stir in 1984, creating a headache for both the RTÉ and the Government. 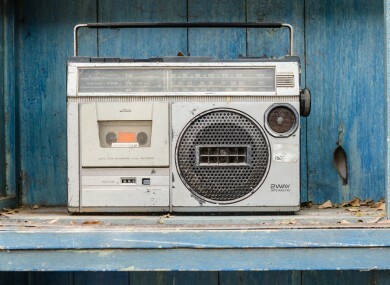 Unlicensed, pirate radio stations flourished in Ireland in the early 1980s — providing younger listeners an alternative to the state broadcaster. Amongst them, were the Dublin stations of Sunshine Radio and Nova — which employed a full roster of presenters. Due to pirate radio stations setting up shop on frequencies with no licence, the Government moved to impose further regulations on them. Meanwhile, RTÉ also attempted to put a stop to stations using illegal frequencies by putting out jamming signals. There was cause for concern as the frequencies being used and the jamming signals impacted on phone lines, as well as frequencies used by hospitals and airports. 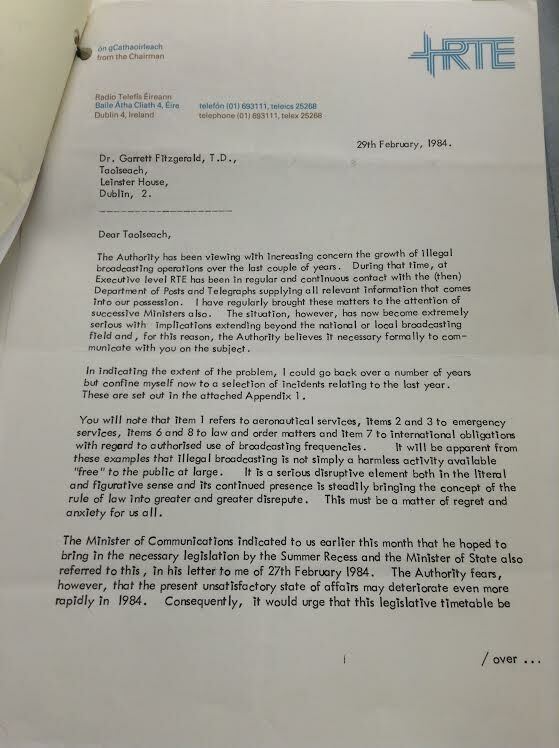 The Taoiseach at the time, the late Garret Fitzgerald, received a number of letters from members of the public, particularly young people, asking for the Government to intervene and begin granting more broadcasting licences. One letter came from an 8-year-old girl, who said that “RTÉ were being mean”, while a 19-year-old from Dublin said the new Bill before Government was “designed to kill pirate broadcasting”. She asked the Taoiseach why they refused to grant them licences. She said that she was unemployed and spent her days listening to music while she sent out numerous of job applications to companies she saw in the Golden pages. 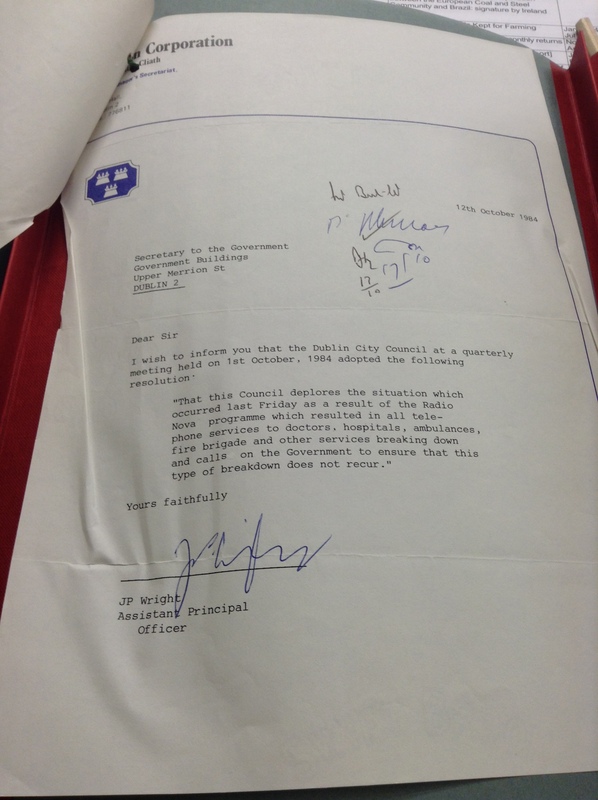 Replying to the letter, Taoiseach Garret Fitzgerald wrote that the Government were not trying to be “spoil-sports” and explained his reasoning. The sender had requested that the Taoiseach write back in his own hand-writing, however, a note from Fitzgerald at the end of the letter apologises to her for not doing so, while also throwing her a compliment about her own hand-writing being very nice, and saying he is a little ashamed of his own. Can’t see the image, click here. Can’t see the image click here. 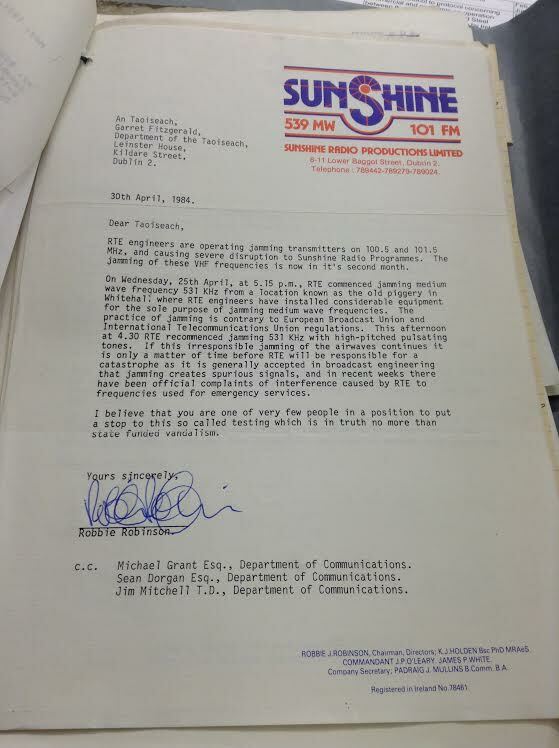 Pirate radio stations, such as Sunshine FM, were also fighting back and getting in touch with the Taoiseach asking him to intervene. Can’t see the letter, click here. The public made the point that jobs were being lost with the radio station closures and there were petitions from those that worked at the likes of Sunshine FM being handed in to the Government. 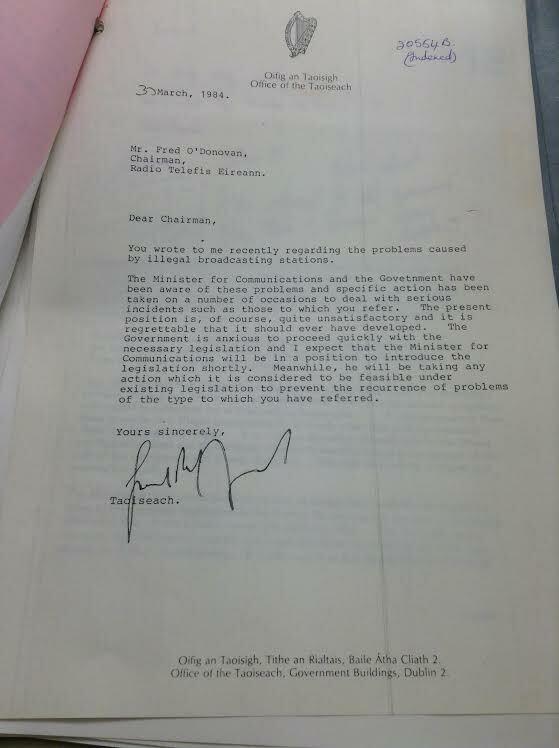 It got to a point where the Government felt they had no choice but to get involved, with an internal briefing note stating that the Minister for Communications at the time would take up the matter with RTÉ. 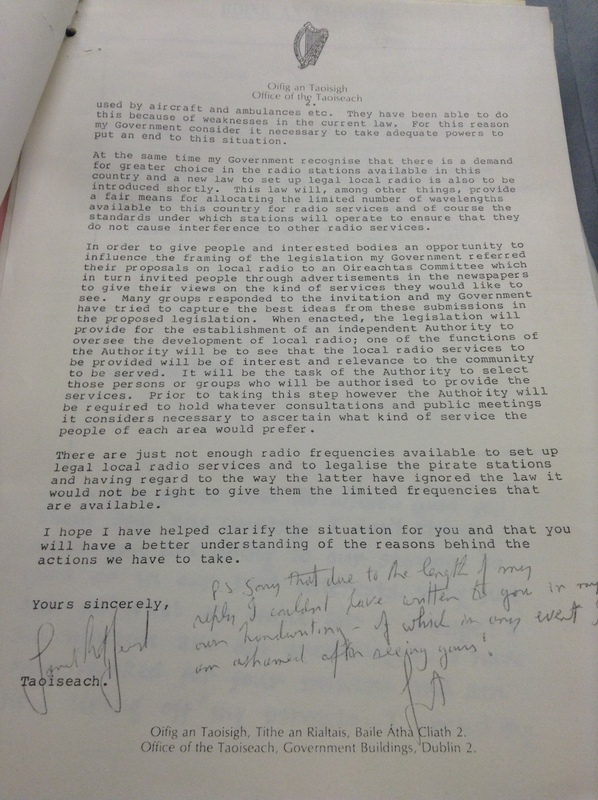 In a politely worded letter to the Chairman of RTÉ, Fred O’Donovan, the Taoiseach Garret Fitzgerald said that the Government would be taking action against them if the continued to cause disruption with the jamming signals. Can’t view this letter, click here. 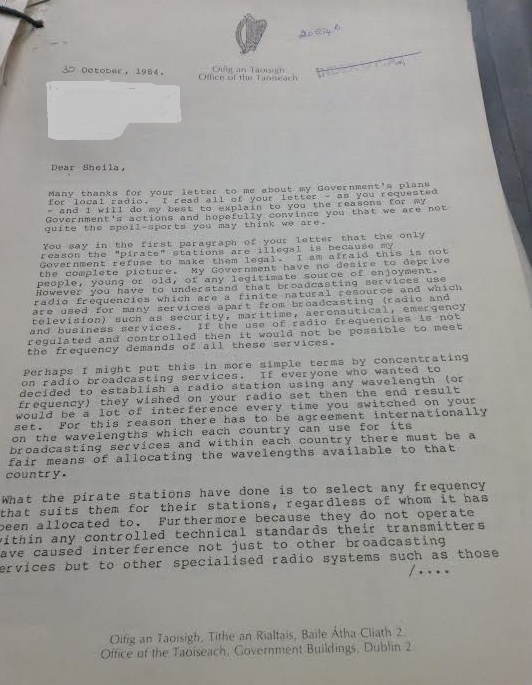 The RTÉ Chairman replied and said that situation with pirate radio stations had become “extremely serious” and he urged the legislation to be moved up the timetable. Email “Stop it! RTÉ was told to stop jamming pirate radio stations”. Feedback on “Stop it! RTÉ was told to stop jamming pirate radio stations”.